We serve Jackson county including the surrounding areas up to a 30 mile radius . Our philosophy is to deliver you the best tree service possible, which includes: Tree Service, Tree Trimming, Tree Care, Tree Maintenance, Tree Removal, Stump Removal, resistograph drilling and deep root fertilization. Which has resulted in many happy, repeat customers. If you need a dangerous tree removed and you’re in the Jefferson/Jackson co or surrounding areas, our experienced professionals can safely get the job done. 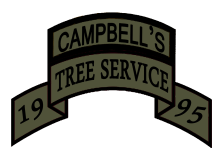 Feel free to contact Campbell's Tree Service at any time – we’re standing by ready to answer your questions 24 hrs a day!